Dana Juniel is the Matthew Shepard Foundation’s Communications Officer. She oversees the Foundation’s media, communications and editorial voice. Dana is a Denver native, holding a BS in Business Administration and an MBA from Colorado State University. 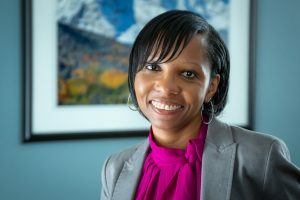 Dana has an extensive background in non-profit communications and development, working for a number of local organizations including: Denver Council on Foreign Relations, Family Tree, Inc., Ralston House, Wings Foundation and Girls Inc. She also founded and co-owned Denver-based event entertainment company, Paparazzi, from 2008-2018. Dana is currently a commissioner on Denver’s LGBTQ Commission and was a member of the Denver Gay & Lesbian Flag Football League. Outside of the office, Dana spends the majority of her time witnessing the world through the eyes of her 4-year-old son Xavier and their dog Rain.